A New York helicopter tour is an amazing, once in a lifetime experience. Not to mention: the amazing views of Manhattan! Book in advance to take advantage of these incredible prices starting from A$297 (if you book in advance) you can take a helicopter flight for 12 minutes. Discover the famous sights of New York by air. 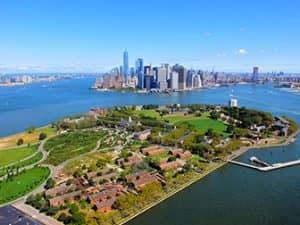 You will see the Statue of Liberty, Empire State Building, the silvery brilliance of the Chrysler Building, and the vast expanse of Central Park. 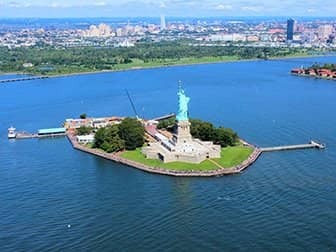 Which New York Helicopter Tour should you pick? Eric’s Tip: There are a number of helicopter tours to choose from. Personally, I have now done more than 20 and I have found all of them to be worth the money. The last one that I did was in July 2018, the 15-minute ride (see here). 15 minutes doesn’t seem long, but you can see all the important places and it was a really great experience. If I had to choose, I would go for a 15 or 18-minute ride (see link below). In my opinion, it is the best value for the money. If money was no object, then I would definitely go for the 25-minute “Grand Island” ride. Always book ahead, because this is often cheaper than purchasing your tickets on the day itself. Maybe make it a gift that someone special will never forget or simply treat yourself. Do you want to do something extra special? Choose the Evening Helicopter Flight. During this flight you’ll enjoy views of the city with all the beautiful evening lights as a backdrop. The evening helicopter flight is especially nice for people who have already taken a normal helicopter tour over New York, and are looking for a different experience. If you want to experience an extra thrill in New York, take the No Door Helicopter Tour. A spectacular experience. Not only do you get an adrenaline rush: without the reflections from the doors and windows, you are also able to take the best photos. Important! After booking your flight, make sure you contact the tour operator to confirm the exact date and time of your booking. After making your booking online, you will receive a voucher by email containing all the operator’s contact information. I advise that you contact them at least two weeks in advance. If you are booking within two weeks prior to your flight, get in touch with the operator right away to confirm the time and date. The earlier you confirm your booking, the more choice you have of the available time slots. If your plans change upon arriving in New York and you want to rebook your helicopter flight, you can do so by contacting the tour operator. Click here to view the helicopter tour routes. Please note there are no flights on Sundays anymore. This makes the other days sell out faster, so reserve your spot before you leave. Below are some photos that I made myself of the helicopter tour I took. This gives you an idea of what you can expect! Below you can see the routes of three different tours. Click on the image to see the routes.